Well is it really useful who might find this book most useful? When you first pick up you get the feeling that it is one of those half magazine, half paperback books that consist of articles cobbled together from a magazine. It is thinner than most copies of MMM and about two thirds the size. In fact although the colour pictures and silky paper are reminiscent of a quality magazine in fact its content is much better put together than might at first be suspected. The second page is headed “How to use this book” and sets out the aims of the publication. I’d say it is perfect for this. If you knew absolutely nothing about motorhomes on picking up this book by the end of it you would know what your choices are, the pros and cons of A-Class, Coachbuilt etc, understand some of the jargon, how to use a motorhome and would be inspired to plan trips at home and abroad. 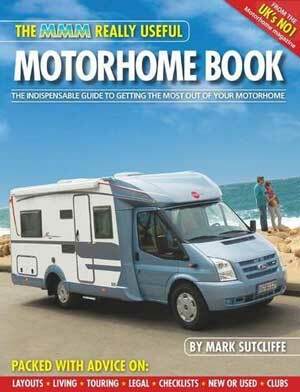 Section 1 is about “Choosing you® motorhome”. First typo! It has information about the types of motorhome, which layout, beds, new or used, driving licence laws and much more all in 70 pages. Section 2 is about “Using your motorhome” and has advice for the absolute beginner, first night, driving tips and practical issues like how to deal with your toilet. It goes on to provide information on gas systems, weights and payloads and electrics. Now throughly briefed on the technicalities of motorhome ownership you can go on to plan your tours of the UK and Europe with guides to ferries and European countries. All in all this is an excellent book for absolute beginners and fulfils its primary purpose “to inspire would be nomads to take the plunge” and buy a motorhome. PS It has nothing of specific help to DIY motorhome builders but since most people building their own camper are first timers it is very useful for you as a new motorhome owner. Some of the information on layouts, gas and electrical systems may give you some gerneral food for thought.